His name became synonymous with the stop, drop electro-house sound of 2006, until a change in style saw him emerge from the underground in to a fully rounded, superstar DJ. He recently supported Coldplay as part of their world tour after being asked to remix their smash hit Paradise and continues to play the biggest venues around the globe. 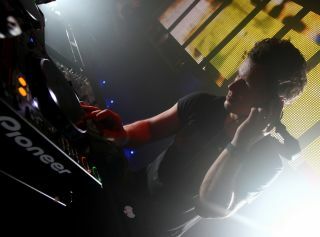 We caught up with after his recent set at Ministry Of Sound, London. It feels like you resisted the temptation to continue solely on the back of Put Your Hands Up and Let Me Think About It… and headed back to the underground club style with your sound. Tell us about this decision and what it was like at the time, did you actively turn your back on the radio? "It wasn't something I did actively, I never make a conscious decision to do my music one way or another, I just make what feels right for me at the time. If a more commercial sound had been buzzing round my head after Let Me Think About It then that's what I would have gone with, but it wasn't, so I didn't." What have been the main changes in the way you produce now? "The main change has been my new studio which I installed at the beginning of this year. I've built a totally perfect acoustic studio that gives me more control of the sound and it's such an inspirational place for me. I'm getting closer to the ideal mix every day." Tell us about the process in creating the Coldplay remix. "I use Logic Pro. Before I start with a remix I make sure I have a certain idea where I want to go. With this one I wanted to have the main hook but still make it danceable." Do you have a special master plug-in chain? "I'm a big fan of the Sonoxx Oxford range - they have some quality plug-ins including limiters, compressors and everything I need. Plus, they're really easy for me to use. I also like UAD, I get a really warm analog sound from using them which sounds so much better and gets the rounded effects that I want in my music." What are your three favorite plug-in synths/ effects right now, and why? "3. NI Massive: super highly editable, pretty much makes any sound you have in mind, not the easiest interface but worth working on it." What's on your DJ rider right now, including tech! I don't really need anything too outlandish, just four CDJs and a Pioneer DJM 800 mixer. And enough Barcardi and coke to last the night. Are you going down the DJ 'show' route, like SHM, Deadmau5, Mason etc, with lights / visuals / pyros? I've definitely upped things as far as putting visuals and VJ shows into my own Takeover parties go. I think it's important to give clubbers a full experience when they come to see you at a showcase party, to really push the boat out so that they walk away buzzing about everything that they've encountered on the dance floor. Having said that, for me the most important thing is always the music; as much as lights and visuals and pyros can add a certain 'wow' factor, it's the music that has to blow people away. Sometimes the best nights don't have the best production but the music just blows your mind and you walk away feeling like you've been lifted to another level. What are your biggest tracks right now on the dance floor and what producers are you most impressed by from a technical point of view? My own private Faithless - Insomnia edit, my Coldplay remix of 'Paradise' and a new track by Deniz Koyu. For me still most amazing producer soundwise is Eric Prydz, what he does in terms of production would take a lifetime to learn but it just seems to come so naturally to him, he's the producer's producer. Do you think it's easier or harder to break through now as an up and coming producer/DJ? Got and advice for people trying to break through? "I think it's definitely harder, for quite a few reasons. There's a LOT of competition out there. I'm not saying that everyone wants to be a DJ, and it's a good job otherwise there would be no-one on the dance floor, but if you're starting out and trying to get a name for yourself there are a lot of other people in the same spot, trying to get the same gigs. And I think the reason for that is that we've moved into a digital era, meaning it's a lot easier to buy tunes, it's far more convenient. In the 'old days' of vinyl, you had to get out there, get into the record shops, get hold of the records and the promos before they sold out or stopped getting pressed up, it almost had to be something of an obsession. "These days you can just log in, download as many tunes as you like without leaving your chair. It's opened up mixing to many more people, which can be a good thing or a bad thing, depending on how you view it. To anyone that wants to break through, my advice would be to work as hard as you can and get yourself out there talking to promoters, agents, management companies. And be prepared to work your way up from the bottom. Don't pass up a gig just because you're not getting paid for it or you're at the bottom of the bill - that's the way that people hear your sound, that you get a following, that other promoters get to hear about you." What's been the hardest decision you've had to make in your career since you started? "Sometimes you have to acknowledge the fact that some people you work with and you have a good bond with, you have to let go so that you can move on yourself. It's a hard decision to make but there comes a time when you need to be, not calculating I think but put your career head on and recognize that to go further you have to take a different road than other people. Thank God I don't have to make that decision too often." "I've got some more tunes in the pipeline, I've got a tour of the States and Canada coming up in the middle of December and I'm also playing in LA for NYE which will be a big one. I'm taking a bit of a break after New Year just because if I don't, I think I'll collapse! And of course I'm also thinking about a new album so hopefully I'll get to schedule that in some time soon."